Mass spectrometry is a powerful analytical technique that is used to characterize, identify, and quantify unknown compounds (here I point out that many people interchange spectrometry with spectroscopy, and that is incorrect: for spectroscopy, think light, and spectrometry, think electromagnetics).It is used in research, medicine, forensics, pharmaceuticals, archeology, geochemistry etc. The applications are endless. This is a very common instrument and tool used in scientific explorations. 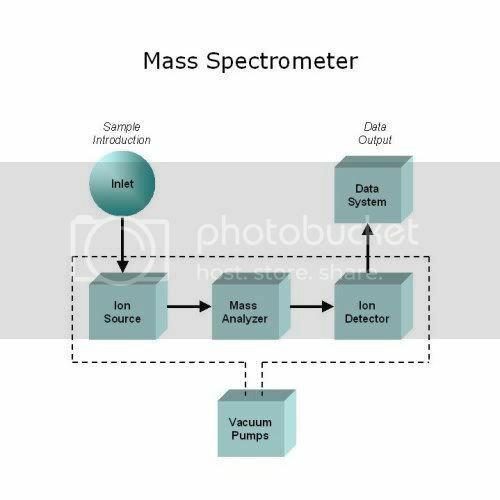 A mass spectrometer (MS) has to convert molecules into ions somehow for detection. How the MS does this varies in the type of MS you are using. Samples are generally in gas phase, but there are some applications that can be in liquid or solid phases as well. The MS measurement is not mass or molecular weight, as the name may lead you to believe, but rather a mass to charge ratio (m/z). This is a very fundamental unit in MS where m= the mass number of the ions in Daltons, and z= the fundamental charge of the ion. In most cases z=1; that means it is in the singularly charged (+1) state and the m/z would equal the molecular weight of that molecule. But that is only if the ion charge came from the loss of an electron; the ion (+1 ) charge can also come from protonation (addition of hydrogen), in that case you must add one mass unit then divide by the formal charge. The way you calculate m/z depends on the way you ionize, (if loss of electron or protonation happens) and the result is unitless (the lack of units for some reason annoys me). Keep in mind that the formal charge may not always be 1. I have provided some examples below to help illustrate it. Examples 1 and 2 are the quick and dirty sort of calculations, and example 3 is more precise for those curious about the long hand of it. If it holds a single charge by loss of one electron it will have a mass to charge ratio of 94/1 = 94. If it holds a single charge by protonation (gaining of H+) it will have a mass to charge ratio of (94+1)/1 = 95. It is also possible to have multiply charged ions in your mass spectrum, especially with electrospray ionization (ESI) and Matrix Assisted Laser Desorption Ionization (MALDI). In these cases your mass-to-charge ratio will be lower than the mass because the charge is greater than 1. So that brings me to Example 2. If it holds 15 charges (by protonation) it will have a mass to charge ratio of (16950+15)/15 = 1131. If it holds 16 charges (by protonation) it will have a mass to charge ratio of (16950+16)/16 = 1060. H = the mass of a proton = 1.008 Da. Therefore the number of charges on the ions at m/z 1431.6 = 1300.4/130.2 = 10. So the analysis of the spectra can be rather difficult just based on how data is presented, even before you go deeper into analyzing what you have and the implications your spectra have on the properties of your sample. Below is a mass spectra example. Part A is the ESI raw Spectra, where you can see the charge states. In Part B they have done the calculations I described to get a molecular mass in Daltons. So to get a mass spectrum, these ions are manipulated by external electric and magnetic fields, and these manipulations all depend on what sort of MS you have. Each MS has 5 main components that are the same for every instrument (notice that there is a vacuum pumping system in the diagram, and this is very important in the instrument because mass spectrometry is almost always done under low pressure in high vacuum. I will discuss why it is needed when talking about my MS). Sample Inlet/Introduction- This is where you introduce the sample into the instrument. Mass Analyzer- This is where you sort and separate your ions. Ion Detection- The detector monitors the ion current, amplifies it and then the signal is transmitted to the data system. What is really great about this is that you can do everything from identification to structural analysis on a MS. 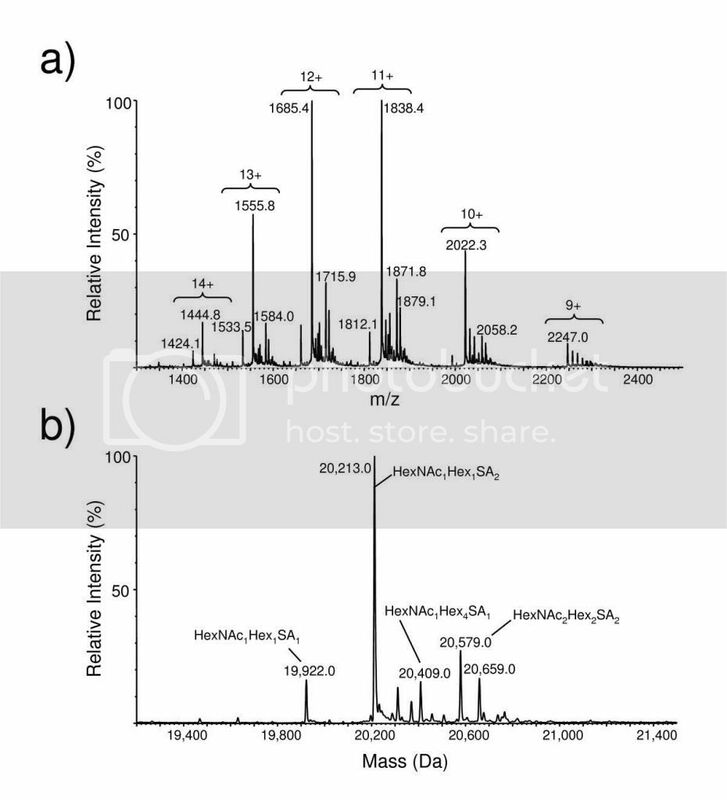 The sensitivity of a mass spectrometer can be good enough that compounds can be identified at very low concentrations (one part in 1012) in chemically complex mixtures. This means that you don’t have to have a large sample to get a good analysis. This is great; things like Nuclear Magnetic Resonance (NMR) Spectroscopy are limiting because it takes much, much more sample to get a good analysis. So how do we really ID a molecule with a mass spectrum? We know that we can find molecular weight, but as we know, in nature you can have a lot of different numbers add up to the same thing. So we do something called fragmentation. Depending on conditions, molecules will fragment in a certain pattern. Imagine you have a puzzle you have it all put together; you throw it on the floor and it breaks apart, but some of the pieces stay together and some completely dissociate. This is really similar to what happens inside an MS. Now imagine you did it several times. It won’t always break on the floor in the same fashion, but the pieces will obviously be from the same puzzle. It also depends on how you are throwing your puzzle: are you dropping it from 2 feet in the air, or throwing it down with all your might? This will make a difference in how it breaks. The way you drop/throw the puzzle can be equated to the type of MS you have for fragmentation. Because it can break differently even with the same conditions, you have to run lots of replicates for reproducibility. These fragmentations make it possible to identify your molecule of interest. In protein research, there are databases you can look at to see what protein you have in your sample, based on the fragmentation. The trouble is having a MS that is able to detect enough fragments for identification. This is a major problem that many mass spectrometrists are trying to resolve. Now that we can ID it, how do we elucidate structure from the MS? Well, one way is a process called Hydrogen Deuterium Exchange (HDX). What happens is that you exchange hydrogen (protons) with deuterium on a molecule. Deuterium is heavier than hydrogen, so the peaks in the mass spectrum will shift 2.01410 mass units (molecular weight of deuterium) per exchange. HDX is frequently used in looking at protein conformations and changes in them. Again, how you do it will depend on the type of instrument you have (for example you may do a collision to introduce the D2 to the molecule or expose your sample in D2O before putting it in the MS etc.). So how does this help, and what does this tell us? Only one set of protons are exchangeable for HDX analysis in proteins/peptides. (I focus in on proteins because this is the one of the more common applications for it and I may be doing a bit of research on proteins conformations myself) The protons for exchange are usually bound to hetero atoms (S, O and N), on the C or N terminus of a protein or on the backbone amides. The polar side-chain protons are 103-106 faster at HDX than those of the backbone amide protons (at neutral pH); because of this, only the backbone amide protons are measurable for HDX. Amide protons on the backbone of a protein/peptide exchange with deuterium at different rates, and this is partially due to the conformation of the protein in question. Other factors that can affect the exchange rates are pH and temperature. Generally the amide protons that are exposed to the solvents are more readily exchanged, while the protons inaccessible to solvent are participating in stable hydrogen bonds and must undergo some sort of distortion of local structure to allow exchange and this results in significantly slower kinetics. Basically this means that these protons will have slower HDX rates because they are physically harder to reach due to how they are placed(location) on the protein/peptide. With this information, the locations of exchanges can be identified, and relative folding and dynamics of the protein can be determined from the exchange rates of the different locations. This dependence of amide proton exchange rates on protein structure and protein-protein interaction makes HDX a powerful tool for monitoring protein conformational changes and mapping protein binding interfaces. To better illustrate this, below is a figure from a paper showing which protons in a protein are exchangeable and which are not. Figure 17.6.1Types of hydrogens in proteins. The six-residue peptide Gln-Asp-His-Pro-Lys-Leu illustrates backbone amide hydrogens (black), nonexchangeable hydrogens bonded to carbon (e.g., gray), and exchangeable hydrogens which cannot be monitored with HX-MS because their exchange rates are too fast (white). In this six-residue peptide, there are only four backbone amide hydrogens that can be monitored by MS, as proline does not have a backbone amide hydrogen and the exchange rates of the N-terminus amide hydrogens are similar to those of hydrogens in side chains, such that they cannot be measured by MS. These are the basics I feel are important so that next I can delve a bit more into my research and information on the MS that I use. MS instruments themselves can range in size from handheld to taking up an entire room. To give you a hint about my MS, it takes up a room and the magnet stands almost as high as me (and I am 5’10”). Thanks for getting through this! I am happy to take questions or explain things more! I took a class in grad school on mass-spec but never got to actually touch the machine. In fact they closed the in-house protien sequencing facility the next year so I never even got to prep samples. Seems very cool though. It is really cool The biggest part of the battle really is getting samples prepped. Usually MS is in tandem with something for separations,(HPLC and GC come straight to mind) the small quantities it can detect can be both pro and a con. Its too bad noone let you use it. Instruments really are lots of fun! Great intro to such a complicated topic. I can tell it was a lot of work too. Do you teach this stuff to undergrads? Thank you very much Jade! It was fun to get everything together. I don't teach anything this in depth though I do mention mass spec. to my undergrads when I go over some instruments but I teach H NMR, CNMR, and IR spectroscopy, fairly in depth to undergrads. in my o chem class/lab.